A friend ordered me a book for my birthday. Unfortunately, it hadn’t arrived on time, but they’d given her a PDF of the book in the meantime. So to tide me over until the hard-copy’s arrival, she gave me a thumb drive with the PDF on it. “No, it’s only 8 gigs,” she answered. I gave her an amused look. I think others in the room caught it and got the joke. Most of us are old enough to remember the era where memory was measured in K, not M or G (or, increasingly, T). But 8 gigs today? Hardly worth the effort. I mean, those things cost like $0.50 a gig now? Q: If every one of my 170k floppy disks for my Commodore 64 were loaded onto that thumb drive, how much room would I have left over? A: Almost all of it. I mean, I’d guestimate that I had somewhere in the neighborhood of 120 disks. Assuming they were all at full capacity, that’d be less than 21 Megs. Not quite enough to fill up my first 40-meg hard drive for my 386, which is itself further back in history from the present day than the Commodore 64 was from its own. That would take up something like 0.2% of the thumb drive space. I’m not going to complain that things were better in the C-64 days (or my old Sinclair ZX80 days with 1K of RAM). No, some might, but I won’t. The C-64 gaming space was kinda like the indie game scene today. Only… the indie scene is even more crowded. There were tons of games, some good ones, some that looked phenomenal for such limited graphics capabilities. I won’t even say games haven’t improved much since then. They have. Although… it does feel like progress has slowed. Not for things that can be measured in megabytes or gigabytes. AAA games have kept pace with the increase in computing power and memory / storage capabilities just fine. We have realistic sweat on characters who have faces with more vertices than the Atari 800 had pixels. For what it’s worth, cool. We’re putting that stuff to good work. Better graphics. Better sounds. Better UI. There’s nothing BAD here. They can present their own challenges, but at their heart, they are good things. But they aren’t the extent of the quality of the experience. I saw a review of Pillars of Eternity the other day that said it was the best RPG Obsidian had ever done. Sorry, can’t locate the review right now. Anyway – whether or not you believe that, there’s something very interesting about the fact that PoE – on its very limited, indie budget, which is rooted strongly in older technology (2D with 3D bits and effects) could knock it out of the park so handily (it has a metacritic score of 90, and I don’t think it’s just got nostalgia going for it). It’s not just PoE. Or Minecraft. Or Thomas was Alone. Or any other low-budget (relatively speaking) hits that are far behind the bleeding edge of the tech race. It’s simply that there are a lot of layers to quality, and sometimes those can be hidden behind a lot of Michael Bay-style explosions. But playing some of the best indie games these days that have held back from the bleeding edge, I see some fascinating experiments (whereas the bigger games, for all their higher production values, tend to adhere closely to the tried and true) or a honing of older styles to a razor-sharp edge. Even for those games, it’s nice to have the luxury of all of that memory and CPU speed and graphics hardware. But it really just means that you can focus on making the most of the technology rather than making it all work. I titled this after the McGuffin of the movie Back to the Future – which was released as long ago this summer (30 years) as the era Marty McFly traveled to in the movie. 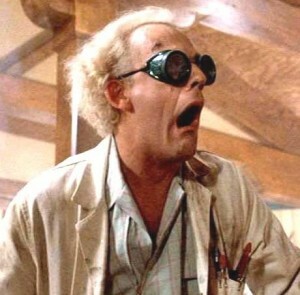 While we don’t have a Mr. Fusion today (sigh…), in the movie, in 1985, 1.31 Gigawatts was a big deal but attainable (with plutonium stolen from terrorists). 30 years in the past, it was a complete impossibility without for pre-knowledge of a lightning strike. 30 years in the future (2015), it was supposedly trivial. But throughout the sixty years touched on in the movie, there was this totally frickin’ awesome time machine. It’s just that the tech needed to power it was easier to obtain. Okay, in my head, it sounded like a cool analogy. And worked with the 8 gigabyte story. Bottom line: Tech doesn’t create coolness. It simply makes coolness easier to power. I read today that the PC version of GTA V needs about 60 gigs. But still, what are 60 gigs when 2 TB drives are cheap as dirt? HDDs were extremely expensive in the eighties, even though their capacity was so criminally low compared to today’s drives. But I’m the last person to complain. On the contrary: I’m in constant wonder what is available and how much one can store. Well, part of this was inspired by my finally getting around to messing with Star Citizen last night. And… well… I wasn’t expecting much, which was a good thing. I had to turn down the graphics options on my reasonably fast, reasonably new (9 months) computer to get it to run anywhere near a reasonable frame rate. Immediately got that old Strike Commander feeling. And … sadly, Strike Commander still didn’t age well, once technology caught up to it. I still want to believe, and it has a very long way to go still, but it’s definitely chasing the tech. No wonder SC hasn’t aged well (even though some people will still claim that it looks great). Personally, I never thought that this was the case. Neither Strike Commander, nor its technical predecessors, the early Wing Commander games, were really beautiful games (except the cutscenes ;)). They were cutting edge at the time, of course, but their fake 3D-graphics were born out of necessity and nothing else as 3D accelerators weren’t available back then. Polygonal space & flight sims were therefore in general either uglier, more primitive or both, regardless of the quality of the rest of the game. They have usually aged even worse. Of course Origin made their games as good as they could (and they were probably one of three studios in the world that were able to) and the games weren’t crap so they got away with it. The newer the (graphically good) games the less problems we have with them – now. But in the future we will say exactly the same: They didn’t age well. That will probably be the case until more games fall into the Uncanny Valley trap (some already do, some skillfully avoid that by making the characters less realistic) and then we’ll complain about that. Photorealism is still miles away. But the pixel-based RPGs of yore like those on the SNES – or even Baldur’s Gate – actually age quite well. I think it’s because of a) the information density (many complicated pixel patterns, pre-rendered or tiled) and b) the fact that the pixels are clearly identifiable. The pixel is clearly to see so we have accepted it. On the contrary: Pixel-based graphics are sometimes considered art now – back then it was only “as good as it is and hopefully we have more pixels in the future”. It appears to me that there is a mass of pixellated (more or less indie) games in development right now than in the last five years combined. So pixel-based graphics are now “retro-chic”, they have aged like old knight armor and other antiques: Not really cutting edge but somehow great to look at! But the technological “race” will never stop unless the nummer one enabler grinds to a stop: Miniaturization. It’s really fully functional as it not only contains CPU and RAM (processing unit) but also a sensor to gather data (input), a wireless interface to transfer the data (output) – and a battery to power all of this so the unit is indeed fully autonomous. The sensation? It’s 4 x 2 x 4 mm small. This means it fits into a single hole of a punch card! This is the *real* achievement of the last 60 years (1955 to 2015). The question isn’t if we can have a computer somehow integrated into our heads (optical nerve, for example, to make blind people see) but *how many* we have!